Sch40 Round Chain Link Posts and Pipes, Color Coated | Hoover Fence Co.
Our Sch40 colored framework is a premium grade round tube/pipe used for commercial and industrial grade chain link job sites. Color coated in choice of brown, black, and green. It is used for the framework, or 'skeleton' of the fence. Use for all horizontal rails, and posts. Can be purchased in full lengths or as cut posts for your convenience. Full lengths are used as top rail and ordered to be cut to length. Sch40 pipe is not available swedged, meaning the pipe will not taper on one end to fit into the next. You must use top rail sleeves also found in our online catalog to sleeve top rail pieces together. Terminal posts for chain link fence are typically 36" longer than the height of fence being installed for commercial, i.e. a 6' high fence has 9' long terminal posts. Chain link line posts are typically 2-1/2' longer than the height of fence being installed for commercial, i.e. a 6' high fence has 8'6" long line posts. Check your local building codes and practices for proper installation. Volume discounts provided on full bundle quantities (see specifications). Post length does not always correspond with footer depth. The footer should extend below the post to frost depth. 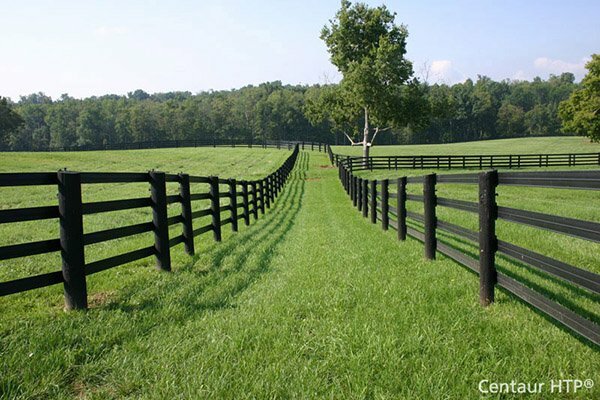 A commercial fence with line posts 8-1/2' long would provide about 2'9" below ground. In many northern climates, the frost depth could be 3' or more. Pour footers to that frost depth and suspend the post in the concrete. This can be accomplished simply by pouring the concrete into the hole first and sticking the post to depth immediately afterward. With a proper concrete mix, the post will not require bracing to stay at the proper height.